A significant number of us are guilty of ignoring our neck region in our skin care treatment. Much the same as the skin on the face, the neck can gradually droop and show other signs of aging. Regardless of what might be the cause, whether as a result of genetics, years of sun exposure, or the normal aging process, an out of shape or ‘turkey’ neck can make you look years elder than you truly are. While your neck may have lost its young look, you don’t need to live with the presence of aging skin. Laser, Ulthera and PDO threads efficiently wipe out wrinkles from the neck with little or no downtime. HOW DOES PDO THREAD work ON WRINKLED NECK? PDO Threads trigger the skins restoration process delivering new collagen: lifting and fixing the skin, smoothing wrinkles, taking care of pores and creating volume, giving a more youthful look to the neck. PDO Threads are dissolved gradually, thus completely ingested in 180-240 days. WHY SHOULD I CONSIDER THIS TREATMENT FOR THE NECK AREA? This is the region of our face that first shows sign of aging. Apparently, everyone wants to remain young-looking for long. By limiting the sagging of the neck and cheek region, it guarantees a smoother-looking skin, giving us the certainty that we are as still looking youthful and breathtaking. WHAT ARE THE BENEFITS OF THE PDO THREAD TREATMENT? Surgery and lifting treatments are costly, and quite a number of us feel that our drooping or sagging skin in the neck and cheek zones does not warrant necessary measures yet. The counteractive action is unarguably superior to cure, so the PDO thread treatment should be possible as safeguard treatment to back off the aging process. This treatment type is cheaper and should be possible as the financial backing permits. The essential benefit is that there is no downtime for this procedure and it should be possible in about thirty minutes. PDO Threads are CE MARK stamped, which means this item meets every one of the requirements for CE surgical sutures. HOW LONG DOES PDO THREAD LAST? The impacts last on average of 2-3 years. WHAT ARE THE BENEFITS OF CONSIDERING PDO THREADS FOR NECK REJUVENATION? CAN I COMBINE PDO THREADS WITH OTHER COSMETIC PROCEDURES? A thread lift is so mild on your body that you can consolidate it with other minor non-invasive procedures (i.e., Ultherapy, microneedling, Botox, injectable fillers, or skin resurfacing lasers) for even more astonishing impact! HOW LONG DOES A PDO THREAD TAKE? The treatment takes up to 50 minutes. After the treatment, you will be given aftercare instructions as guidelines to follow. Most patients encounter some mild swelling and wounding, although this often settles rapidly. Recovery time is always short of a week, albeit strenuous exercise must stay away from for around two weeks. WHAT IS LASER NECK REJUVENATION? Laser neck rejuvenation is a treatment that evacuates the top layers of skin on your neck to enhance neck skin’s texture and tone. Laser neck resurfacing does enhance the presence of fine lines as well as wrinkles. HOW DO LASERS WORK FOR NECK REJUVENATION? In the course, the laser neck resurfacing procedure, a high-intensity light emission energy (laser) is concentrated at the neck zone which obliterates the external layer of skin (epidermis) on the neck and in the meantime heats the underlying skin (dermis) to stimulate the development of new collagen filaments. As the bruise heals, new skin that is smoother and more tightly forms on the neck. WHEN WILL I START SEEING RESULTS AFTER LASER NECK REJUVENATION? The treatment is an erratic one and results can be seen promptly, with best results noticeable between six to twenty-four weeks after the procedure. You’ll be left with firmer, more tightly skin around the neck, which additionally lifts the face and gives you a scar-less youthful appearance. Laserneckrejuvenation treatment is not painful. Before treatment, the professional or practitioner will apply anesthetic cream to the area to be treated to limit the risk of any distress for the patient. Most patients see changes in the tone and state of their skin instantly following a skin neck wrinkle treatment. Because the system is intended to fortify the natural development of collagen, the patient’s ideal results may take up to a couple of months to be noticeable. WHAT ARE THE SIDE EFFECTS ASSOCIATED WITH LASER? The typical side effects of a laser neck restoration procedure are redness and swelling, and they should subside within two or three days. In uncommon cases, patients experience wounding and blistering, and some patients encounter changes in pigmentation of treated regions. 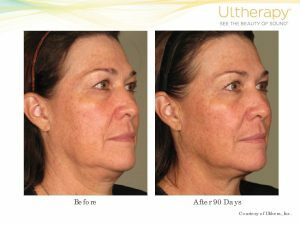 Ultherapy is a non-surgical, non-invasive treatment that utilizes centered ultrasound energy to lift and tighten the skin. It works by bypassing the surface of the skin to deposit the appropriate amount of ultrasound energy at the right depths and temperature to invigorate collagen development. COULD ULTHERA HELP REMOVE WRINKLES FROM MY NECK? Frequently referred to as a non-surgical facelift, Ultherapy is the only cosmetic procedure of its kind to be endorsed under the thorough norms of the FDA (Food and Drug Administration). It’s an incredible treatment in case you’re hoping to lift and tighten regions, for example, the face, neck and upper chest. WHY IS ULTHERAPY BECOMING SO POPULAR FOR REMOVING NECK WRINKLES? Ultherapy can enable you to accomplish more youth-looking skin on your neck in a single treatment that takes around an hour to perform. There’s no long healing time and treated patients report their skin feels more tightly instantly. However full results are seen 60– 90 days after the treatment. 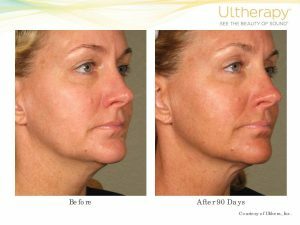 Ultherapy is an excellent treatment in case you’re not exactly prepared for surgery, but instead, need to lift and tighten the skin on your neck. There’s no aesthetic and no real surgery; you will be able to return to your daily routine straight after the treatment, which makes it an excellent match for somebody with even the busiest calendar. It’s likewise applicable to any skin type. WHAT DOES ULTHERAPY TREATMENT INVOLVE? Before your treatment, you don’t need to stress over setting yourself up or your skin, as the procedure itself depends on a ‘see’ and ‘treat’ hypothesis. The handpiece is put onto your skin on your neck by your expert, and a picture is projected onto a screen (where they can perceive what they have to treat), so they can plainly observe which areas of the neck they have to treat. 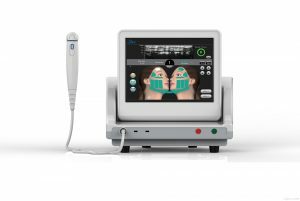 Ultrasound energy will be discharged into the deep skin tissue of your neck skin, which can cause some stress, yet this is transitory and a sign that the collagen-building process has begun. The session will ordinarily last around 30minutes to an hour. HOW LONG DOES THE BENEFITS LAST? Patients frequently reveal they feel like their skin is more tightly instantly in the wake of having the treatment, although the full advantages of the treatment won’t be obvious for 60– 90 days after the treatment. Some patients see improved changes in the treated region up half a year later. Ultherapy has been cleared by the FDA and has been confirmed safe in copious clinical investigations. It’s very safe since it utilizes ultrasound, a similar sort of waves specialists or doctors have used to watch babies in the womb for a considerable length of time. Since its more of a facelift without surgery, there’s no long recovery period and no risk of infection. HOW DOES ULTHERAPY DIFFER FROM LASERS? Laser treatment procedures are ordinarily used to address imperfections on the skin’s surface, for example, wrinkles, fine lines, and pigmentation changes. Ultherapy, then again, addresses issues further in the skin’s foundation such as a breakdown in collagen. Collagen is a particular protein that gives skin its youthful appearance by keeping it firm, tone, and elastic. As we grow old, this elasticity decreases. In any case, Ultherapy helps start the repair procedure for new collagen generation. CAN ULTHERAPY BE COMBINED WITH OTHER TREATMENTS? As a non-invasive PROCEDURE, Ultherapy can securely be joined with other neck rejuvenating procedures to accomplish prevalent results.